British stocks would be the best-performing equities in Europe should Britain vote for Brexit in 10 days time, according to a note sent to Deutsche Bank clients on Monday morning. In the note, Deutsche analysts led by Sebastian Raedler argue that while stocks across the continent will fall, British companies will come out relatively unscathed from Brexit vote. That is thanks to the substantial weakening in the pound that seems to be inevitable if Brits do choose to leave the European Union. That drop in the pound would help support UK exports, and therefore prop-up export-reliant British firms. The FTSE 100 will drop by around 5%, the bank argues, an outperformance of 5% on the Stoxx 600 broad index of European shares, while Germany’s DAX will be the worst hit individual index on the continent, falling as much as 10%, Deutsche argues. That fall leads the bank to put an underweight rating on the DAX, but an overweight on the FTSE. Bookmakers’ odds point to a 70% probability of a Remain vote, down from 80% two weeks ago. We think European equities could rise by around 5% in a Remain scenario, driven by lower uncertainty and tightening peripheral spreads. In case of a Leave vote, we see around 10% downside for European equities at first (though this could be offset by a swift policy response). 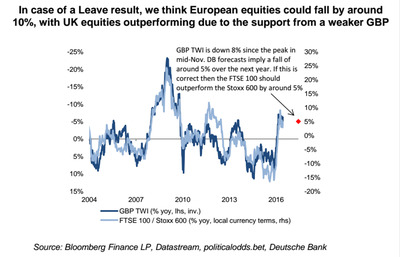 We think UK equities are set to outperform Europe in this case, given likely GBP weakness. The basic premise of Deutsche’s argument is that when the pound falls, that makes exports from Britain more attractive to foreign buyers. The FTSE is heavily reliant on companies which exporting goods for much of their business, and as a result, the falling pound could help support share prices. 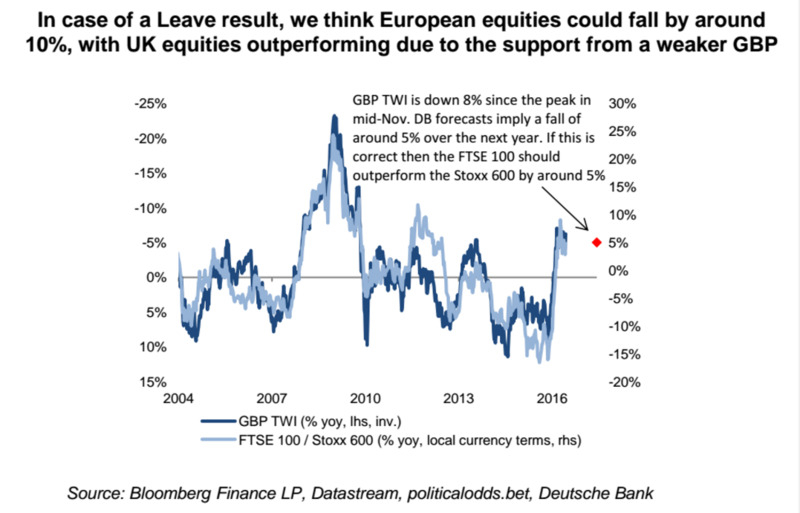 While Deutsche Bank says stocks would slip if Britain chooses to leave Europe, Deutsche argues that a Remain vote, which is seen as far more likely, would boost stocks on the continent by around 5%, with UK equities seeing even bigger gains. In May, Raedler and his team of analysts warned that stocks in Europe could end the year nearly 20% lower, and argued that they see “no further upside” in the equity markets, citing “the combination of weak global growth, Fed risk, a likely fade in China’s growth rebound and fragilities in the US high-yield credit market,” as reasons for their worry. The team also added that in the worst case scenario, the Stoxx 600 could end the year 20% lower than its current level.